Yesterday was the "Made by Google" live event, roaring around the web from San Francisco. As well as a hot new Pixelbook laptop, additions to the Google Home range, and a camera that takes pictures by itself of things it thinks you'll find interesting (Google Clips), there was also plenty to say on the phone front, including the new Pixel 2 and big brother Pixel 2 XL. AI, AR and VR featured heavily. As our sister site The Virtual Report wrote: "Yesterday's Google’s live event today centred heavily around the shift from a mobile-first to an AI-first world across all their products, starting with CEO Sundar Pichai’s introduction and continuing throughout presentations from the Home team and Pixel 2 smartphone." The Virtual Report continues: "The speakers reminded us that Google’s all about the intersection between AI, software and hardware." The company announced the successors to its popular Pixel mobile devices. Both boast a 12.2-megapixel rear camera in the rear and a fixed-focus forward-facing 8-megapixel camera. Like Apple's new phones, you're not given a headphone jack (Google revealed its own wireless Pixel Buds headphones). The Pixel 2 XL has a bigger battery, and with a six-inch OLED screen (2880 x 1440 resolution) it has a larger viewing area than last year's. Both are available for pre-order now but become available on 19 October. The Verge reports that the Pixel 2 64GB will cost $649, while the Pixel 2 XL 64GB costs $849. The 128GB options will reportedly cost $749 and 949, respectively. An hour into the event, Aparna Chennapragada, Director of Product and Engineering at Google spoke about ARCore. She demoed a new feature called AR Stickers that’s built into the Pixel 2’s camera and will be exclusive to the platform. The live demo showed characters from Netflix TV show, Stranger Things, which appeared and reacted to objects around them, including other stickers. Chennapragada explained that the Pixel 2’s camera has been calibrated for AR, enabling it to “bridge the physical and digital”. You can see the TechCrunch team trying out the Stranger Things AR experience here. Other brands available will include Star Wars: The Last Jedi. 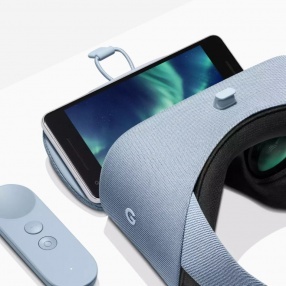 When the Google Daydream View was first released, its smart fabric appearance turned a functional HMD device into an attractive piece of wearable tech. Although Google had announced a standalone non-smartphone headset earlier in the year, yesterday's update basically brought us three new colours and updated lenses to go with the Pixel 2. The price for the revised headset will be $99 and the three of them will formally be released on 19 October. There's more about Google's plan for its Pixel 2 range at the official page.